Items on this page are restricted to authorized TSA/DHS purchasers. Items may only be purchased by authorized TSA/DHS entities. Ordering instructions: Add items to your cart after entering the three letter airport code where indicated. Quantities may be adjusted for each item after adding it to your cart. Free shipping is included with each item. 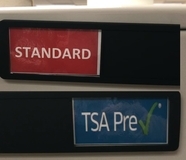 Includes: 3 PreCheck Tags, 3 Standard Tags, 1 Crew Tag and 1 Sliding Status Indicator. © 2019 Radiopaque Solutions, Inc. All rights reserved.